Buying Costa Rica real estate is a big decision, with many factors to consider. Below are just some of the many advantages that Las Villas de San Buenas has over other Costa Rica real estate options. 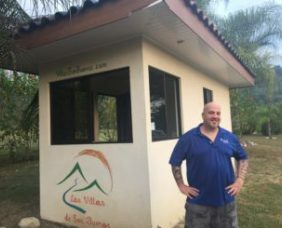 Las Villas de San Buenas is perfectly located 2 km from a paved highway, far enough away so as to not hear the traffic, and yet, close enough to quickly jump on the highway. Additionally, the access is flat and it is not necessary to have a SUV or 4×4 vehicle to access the development. 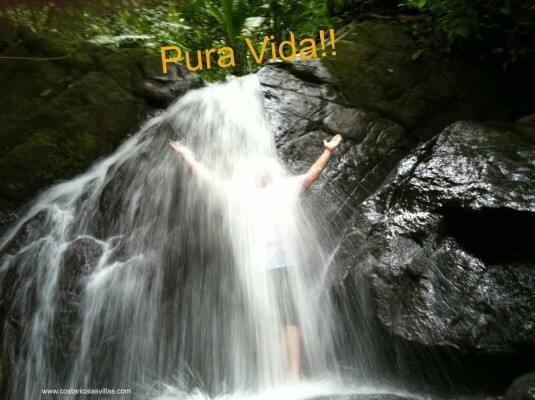 Once you spend a week in Osa, you will see what an advantage that is! The amenities are close too! Next door is the only golf-course in a 100 mile radius (with discounted memberships available). Five minutes away to a large, modern healthcare facility and restaurants, ten minutes from a beach and turtle sanctuary, 15 minutes to large grocery stores in Uvita or Palmar Norte (there is a convenience store 1 km away – great to walk or bike to). The village of San Buenaventura, where Las Villas de San Buenas, is a friendly and quaint town. We hire many workers from the community, and it’s not unusual to have our clients be invited to nearby homes to enjoy a cup of coffee with a local family. Las Villas de San Buenas is close to a large, modern, hospital that is open 24-hours and offers a wide range of medical services and procedures. For photos and information click here. Las Villas de San Buenas is located within 10 minutes of Playa Tortuga and the turtle sanctuary located there. Arguably, the areas best beach, Playa Ventanas, is less than 15 minutes away. For videos and photos of the nearby beaches, click here. Lifelong San Buenaventura resident Melvin and Chairman Duane Halverson enjoy a good laugh during one of their many conversations. 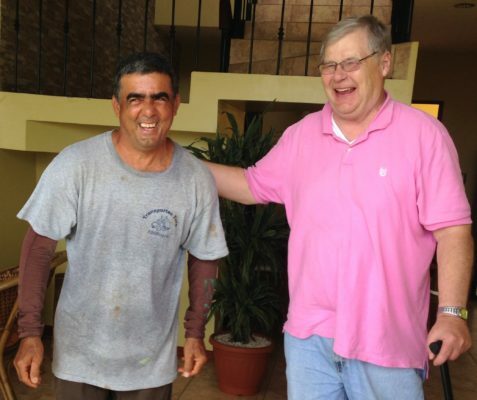 Close local ties are important to everyone at Las Villas de San Buenas. We are in the preliminary stages of our Residential Mountain View lots offering. We have sold over a dozen lots and will soon be ramping up our marketing and selling efforts in early-to-mid-2018. For now, our lots start at $19,900 which have beautiful 180 degree mountain views with financing also available. 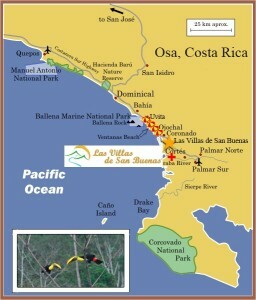 This is one of the best Costa Rica real estate options available! Being a part of a gated community, and protected by Costa Rica’s condominium laws, your lot and home will not be devalued by a neighbor’s unkept yard or dilapidated home. More than 90% (and perhaps more) developments in Costa Rica have unenforceable rules, as most developers do not take the time or resources to properly permit their development. Las Villas de San Buenas will be one of the largest properly permitted, condominium lot developments, in all of Osa. Once you decide to build a home, homeowners can have their home professional managed by the Property Management company, Osa Property Management. Regardless of where you live in the world, rest assured that your property and home is being well maintained, your electricity and internet bill is being paid and your yard kept professional looking. Costa Rica real estate ownership has never been easier. 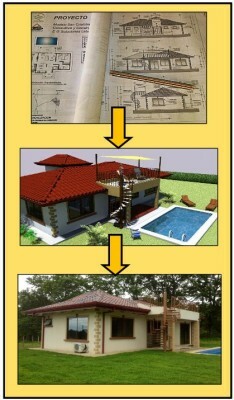 Let your Costa Rica real estate and home help pay for itself! Should you decide to rent your home out, it will be a part of the Homeowners Rental Program. All check-in, check-out, payment collection, home cleaning, etc is performed by Osa Property Management. Typical weekly rates for a two-bedroom home, with a pool, rents for $650, before fees are subtracted. Costa Rica is an extremely safe country with crimes rates below many US Cities (including Lincoln,Nebraska!) and San Buenaventura has minimal to no serious crime. We have a great relationship with the local community, and are often times hosting birthday parties, school celebrations and sometimes even weddings, for the local community. Wonderfully, our owners and visitors are often times invited into the homes of our community neighbors in San Buenaventura to share a cup of coffee or enjoy a game of bingo at the local Catholic Church. Las Villas de San Buenas’ core masterplan was designed by an award winning planner to ensure almost every lot was next to or near to a park, green space or common area, and provided easy walking trails throughout. The design, coupled with planned trails and landscaping, provides both privacy, and easy access to friends and neighbors and community activities, should you choose to participate. The entire area of residential mountain views have over a mile of walking trails connecting the planned parks and providing easy and enjoyable passage to other parts of the development. Work with our team in choosing one of our home designs (or have us custom design one for you), make any requested changes, and we will do the rest (purchase materials, acquire permits, insurance, etc). We provide weekly photo-recaps so you will see the progress from the comfort of your home. When it is complete, we will hand you the keys and you can enjoy your home immediately (we will even purchase furniture and appliances for you if you want). Once your home is built, our property management program ensures that your asset is protected and well kept – whether or not you choose to have us offer your villa for rent to make additional income or not.